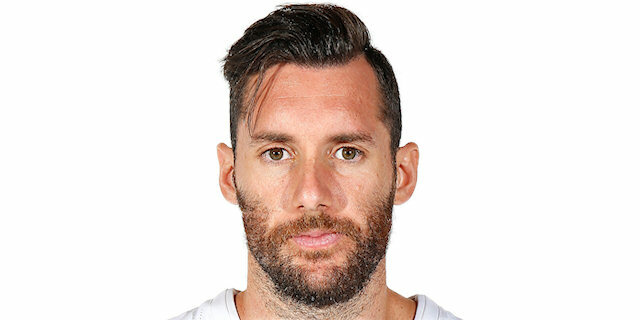 Real Madrid held off Olympiacos Piraeus 82-77 Thursday at the Community of Madrid Sports Palace to take a 2-0 lead in their best-of-five playoffs series. 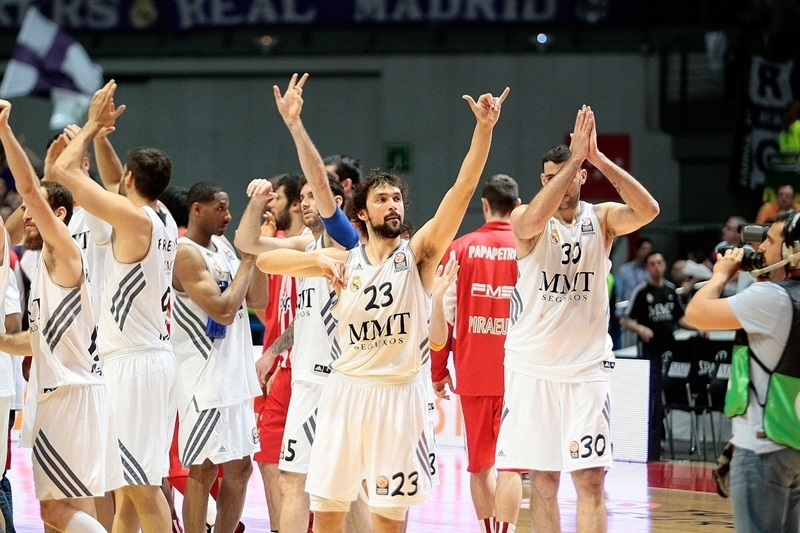 Ioannis Bourousis punished his former team with a double double, Sergio Llull effectively ran the offense and Rudy Fernandez starred from his role on the wing to lead Madrid, which can clinch a spot in the 2014 Turkish Airlines Euroleague Final Four in Milan with a win next week when the series resumes in Greece. Rudy and Nikola Mirotic each scored 9 first-quarter points as Madrid took control early. Felipe Reyes sank a pair of threes early in the second quarter as the difference reached double figures. 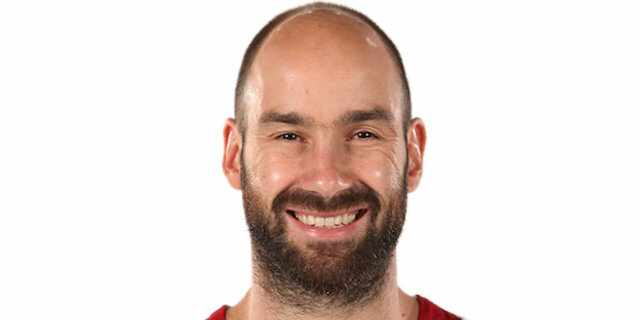 Brent Petway helped Olympiacos respond and after trailing 53-44 at halftime, a Vassilis Spanoulis triple made it 55-52 early in the third quarter. However Madrid always had an answer. 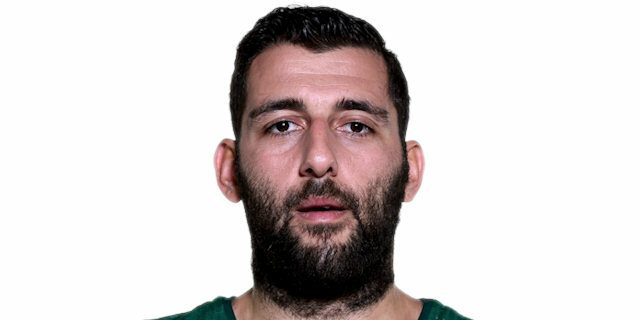 Olympiacos rallied one last time in the closing minutes of the game behind Matt Lojeski, but a Fernandez rebound and Bourousis free throws helped ice the game. Bourousis finished with 19 points and 10 rebounds, Rudy scored 15, Mirotic 14, and Llull and Sergio Rodriguez each scored 11. Lull dished 7 assists, Rodriguez had 5. Spanoulis led Olympiacos with 18 points, Lojeski scored 13, Bryant Dunston and Petway netted 12 apiece and Georgios Printezis 10. Olympiacos hurt its chances by making only 15 of 27 free throws (55.5%). Madrid won the opening tip and struck quickly on a Rudy fade-away jumper from the foul line. Olympiacos went right to Spanoulis, who drove, drew a foul from Tremmell Darden and tied the score from the line. An Ioannis Papapetrou jumper in transition gave the Reds their first lead, but Llull soon nailed the game’s first three as Los Blancos went ahead 6-4. Papapetrou remained a factor with a basket-plus-foul and Dunston dunked in the missed free throws. The pace heated up as a Spanoulis triple capped a 0-7 Olympiacos run. Bourousis scored inside to keep Madrid close and Rudy nailed a three to even the score at 11-11. Vangelos Mantzaris with a mid-range jumper and Fernandez on an alley-oop slam from Llull kept things square midway through the quarter. After the TV timeout, threes from Mirotic and Llull put the hosts back on top, but Printezis scored twice to keep Olympiacos close. 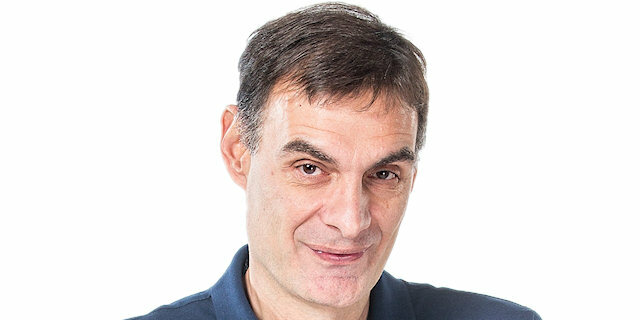 Rudy sank free throws to boost the Madrid lead to 6. Lojeski came in and scored quickly for the visitors, but a Mirotic three made it 28-21. Bourousis scored again inside and drew Dunston’s second foul. Dunston responded with a bucket in the closing seconds of the quarter to make it 30-23. Madrid forced a pair of 24-second violations and Reyes sank a pair of threes as the hosts extended the lead to double figures. Petway split free throws for the Reds first point of the quarter. Salah Mejri thrilled the crowd with a block of Giorgi Shermadini at the rim. 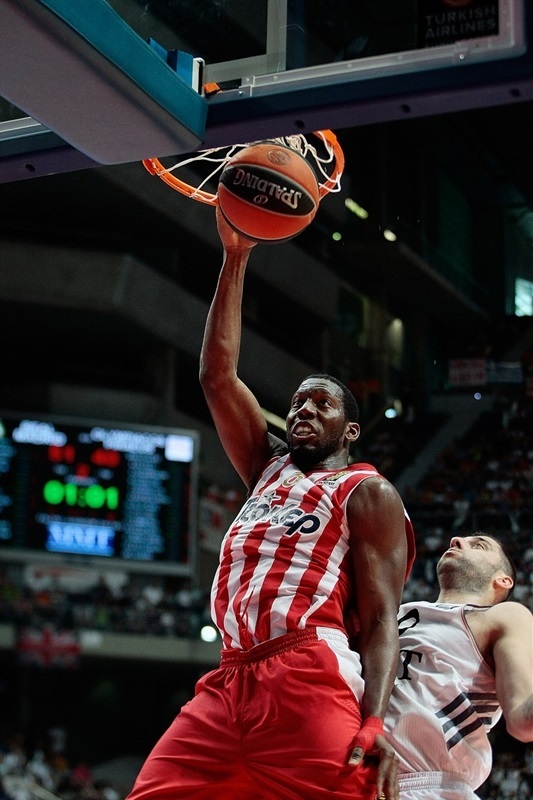 Olympiacos hung on as threes from Mardy Collins and Petway sandwiched a Madrid triple from Rodriguez. Lojeski sank free throws and Kostas Sloukas a three to trim the gap to 43-35. 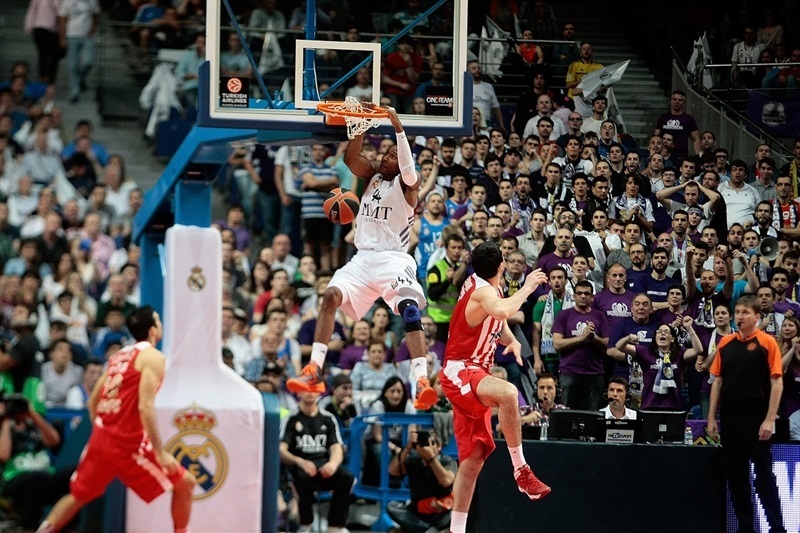 Rodriguez fired in a second three as Los Blancos retained a comfortable lead. Petway stripped Fernandez and fed Petway for a slam over Bourousis, after which tempers started to flare. On the next play, Collins was called for an unsportsmanlike foul on Rudy. A Bourousis slam put Madrid up 49-37. Petway responded with a three before Bourousis and Dunston traded buckets inside. After Lojeski free throws, Rodriguez penetrated for a layup. 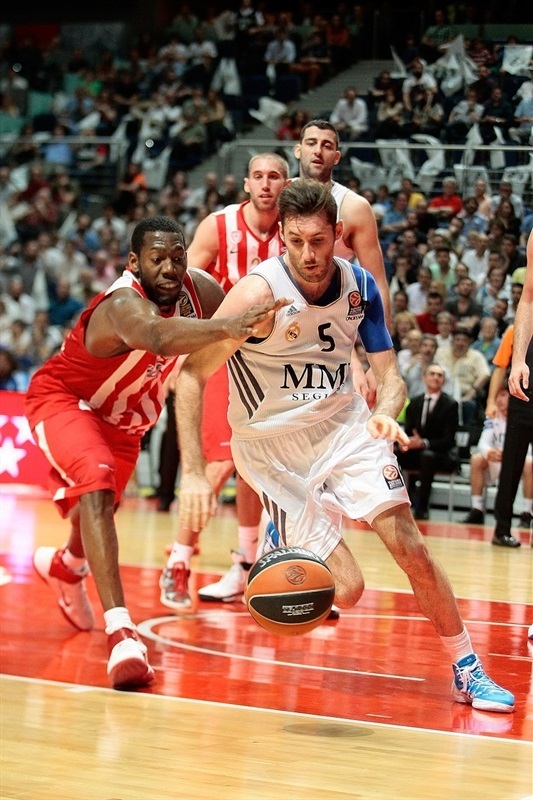 Mejri blocked Spanoulis to keep Madrid with a comfortable 53-44 halftime lead. The Reds came out charged up and cut the difference through Dunston inside and Spanoulis from deep. Bourousis scored for the home team only for another Spanoulis triple to silence the crowd at 55-52. Rudy came to the rescue for Madrid with a layup and a quick three. Llull drew a foul from Spanoulis while shooting a three and restored a double-digit Madrid lead by making the foul shots. Four missed free throws between Dunston and Printezis further deflated the Reds. Printezis atoned with a jumper, but Bourousis scored again on the offensive glass. A floater by Llull made it 67-55. Spanoulis answered with a basket-plus-foul, but also missed the free throw. A Bourousis three gave Madrid a 13-point advantage. 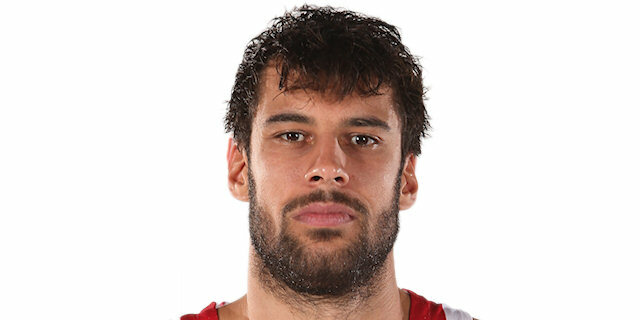 Printezis added points from the line. Dunston split free throws before Printezis netted his trademarked one-handed push shot. A Reyes layup came after the buzzer and left the score at 70-62. Marcus Slaughter came off the bench and made an immediate impact with an alley-oop slam thanks to a fine pass from Rodriguez. The lead grew as Darden sank free throws and Dusnton split a pair at the other end. Mirotic added another from the charity stripe to make it 75-63 midway through the quarter. A Petway three ended a five-plus minute scoreless stretch for Olympiacos, but Mirotic converted a three-point play at the other end. Lojeski split free throws before Spanoulis and Lojeski each scored to make it 78-71 with two minutes remaining. After a Rodriguez turnover, Lojeski made it a 5-point game with 95 seconds to go. Mirotic split free throws and Lojeski scored inside. 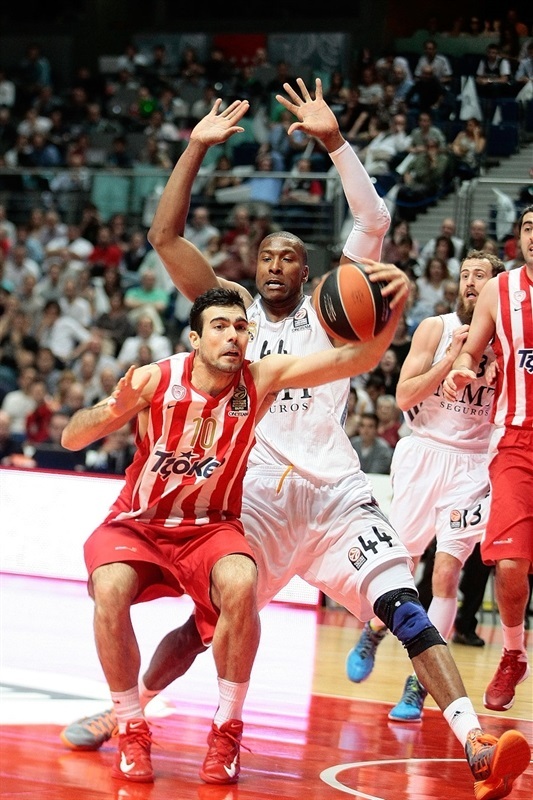 Olympiacos sent Rodriguez to the line with 47.9 seconds remaining and he made only 1. But Dunston missed in the paint with 33 seconds left, Rudy was first to the rebound and Bourousis iced the game from the line. "Our first half was very good offensively. We had the feeling that we were dominating the game more from the attack than the defense. I just think about basketball and we know how difficult it is to play in Greece. I am just thinking about Olympiacos, not about the Final Four. I hope my team is ready for Monday’s game." "They played with intensity in the first quarter with good shooting percentages. In the second half, because of our good defense, we closed the distance, but we did not score many free throws and we could not catch Real Madrid. Now, we are going to try bring this series back to Madrid and we know that is difficult to win the next two games, but it is our goal." "The key that allowed us to win these two games at home was the defense. We played a great defense. Now we are a little tired, but we are up 2-0, and that is the most important thing. On Monday we will face a complicated game. I know the Olympiacos crowd and it is very hard to play in their court against them. They try to help their team get the victory. We have to be very focused from the beginning of the game." "The most important thing is that we are 2-0. The team has a lot of merit playing in the way we are playing. We are doing a great job and it is true that against Olympiacos we are finding problems to close the games, but we have a lot of confidence in ourselves and we are playing very serious." "We have to play game by game. We are Euroleague champions and nothing is decided yet. We played today a very good second quarter with good basketball and a good tempo. But after that, we missed in the third quarter some free throws and some baskets that we must score to win these kinds of hard games." "The key to winning the game on Monday is defense. We have to play a good defense. I think we lost today because of details like the fact we missed some shots today, some free throws."